All USPS delivery methods include USPS tracking numbers to ensure receipt at delivery address. If there is any concern as to where the USPS may leave your package, the USPS Signature Confirmation upgrade is strongly recommended as Store.e-Cigarette-USA.com will not assume responsibility for any package once USPS has picked up from us. Packages shipped via USPS can be tracked online at the USPS website. Packages shipped via USPS may have limited tracking information before arrival at postal sorting stations. Status may only show as Electronic Shipping Info Received at some points. Notes will say The U.S. 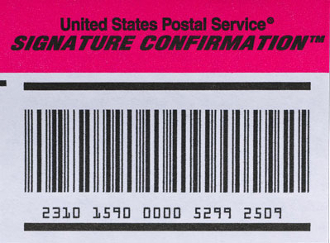 Postal Service was electronically notified by the shipper on (shipment date) to expect your package for mailing. This does not indicate receipt by the USPS or the actual mailing date. Delivery status information will be provided if / when available. No further information is available for this item. This is normal and means that the package is currently en route to you. Once a package has been shipped out per your order specifications, it is literally out of our hands and becomes the responsibility of the postal service. Please add this option to insure delivery. Store.e-Cigarette-USA.com supplies you with a tracking number. If your product is stolen from your door step or mailbox Store.e-Cigarette-USA.com is not responisible. Please add this low cost option for a piece of mind. The USPS charges $2.79 for this option. We make no profit from it. All on-line customers using Master Card to pay for their orders must also pay for signature confirmation ($5.95) as per new Master Card regulations. Orders that qualify for free shipping does not include the signature confirmation, this must be paid by the customer. Note: Please add this option to the shopping cart as an item.